This project was part of a long-running programme of research on the basal ice at the margin of the Greenland ice sheet. Funding for previous phases of the research had been provided by the Natural Environment Research Council and the Royal Society. This section of te work, funded by the Royal Society, was a pilot study to assess the potential for using moraine sediments to reconstruct the characteristics of basal ice. This pilot study was based on a field expedition to Greenland in September 1999. Since 1984 I have been involved in work that has shown how conditions beneath an ice-sheet can be deduced by analysing the basal ice exposed at the ice-sheet margin (e.g. : Knight, 1994). One of the justifications for doing this work has been that, if the sedimentological characteristics of the basal ice are preserved in sediments left behind after the ice sheet retreats, then it will be possible to reconstruct former subglacial conditions in previously glaciated areas such as the UK. There is much dispute as to whether basal ice characteristics can generally be preserved postglacially, but I have developed an environment-based model that predicts specific geomorphic locations where basal ice signatures are most likely to survive. The aim of this program is to test that model. I have been working at a site in Greenland where distinctive variations in the debris content of basal ice occur over short distances due to topographic disturbance of ice-flow (Knight et al 1994). There exist at the site many intra-moraine locations where sediment released from the ice-front is trapped in long-term sediment stores that are largely unaffected by local surface water flow. Although the structural characteristics of basal ice are unlikely to survive in a post-depositional context, the bulk characteristics of sediment delivered to these locations are likely to be preserved. These locations represent theoretically perfect sites for long-term preservation of the basal-ice debris-signature: if preservation is at all possible, it is in locations of this type that it will occur. The aim of this research is to carry out a sedimentological exploration of sediment traps both close to the ice margin and in moraine ridges of various ages in the proglacial area, so as to establish whether the localised variations already recognised in the characteristics of the ice are preserved as localised variations in proglacial sediments. Knight, P.G. 1994: Two-facies interpretation of the basal ice layer of the Greenland ice sheet contributes to a unified model of basal ice formation. Geology, 22, 971-974. Knight, P.G., Sugden, D.E. and Minty, C. 1994: Ice flow around large obstacles as indicated by basal ice exposed at the margin of the Greenland ice sheet. Journal of Glaciology 40 (135), 359-367. North is up. Photo covers about 15km west-to-east. The field site is at the margin of the Greenland ice sheet near Kangerlussuaq, about 35 miles north of the arctic circle and 100 miles from Greenland's west coast. 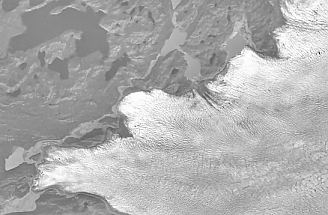 Observations of basal ice and moraine characteristics were made around the margin of the Russell Glacier (left). This project stems from several years of research at the site by the project leader. The project team conducted fieldwork during September 1999, operating from a base camp at the margin of the Russell Glacier. Logistical support was provided by helicopter and jeep charter from Kangerlussuaq. The expedition successfully achieved the aims set out in the original application. We collected data on recent changes in the position of a section of the margin of the ice sheet, and correlated changes in the morphology of the margin with changes in basal ice, in ice-marginal moraines, and in sediment routing between the ice and the proglacial area. We measured debris characteristics and deformation structures in basal ice and in ice-marginal moraines, and we found that the sedimentological characteristics of the basal ice can be preserved in the proglacial moraine. We found that the diagnostic high clay and silt content of one particular type of basal ice (the so-called 'dispersed facies') was reflected in the sedimentology of moraines that were supplied by parts of the glacier that contained this ice. We also found that sublimation of ice in winter conditions permitted the preservation of stratigraphic features and tectonic structures from the ice in the sediments that were left behind after ablation. Knight, P.G., Patterson, C.J., Waller, R.I., Jones, A.P. and Robinson, Z.P. (2000) Preservation of basal-ice sediment texture in ice sheet moraines. QUATERNARY SCIENCE REVIEWS 19 (13), 1255-1258. Knight, P.G., Waller, R.I., Patterson, C.J., Jones, A.P. and Robinson, Z.P. (2000) Glacier advance, ice-marginal lakes and routing of meltwater and sediment: Russell Glacier, Greenland. JOURNAL OF GLACIOLOGY 46 (154), 423-426. Knight, P.G., Waller, R.I., Patterson, C.J., Jones, A.P. and Robinson, Z.P. (2002) Discharge of debris from ice at the margin of the Greenland ice sheet. JOURNAL OF GLACIOLOGY 48 (161), 192-198. Knight, P.G., Jennings, C.E., Waller, R.I.. and Robinson, Z.P. (2007) Changes in ice-margin processes and sediment routing during ice-sheet advance across a marginal moraine. GEOGRAFISKA ANNALER (A) 89 (3) 203-215. Knight, P. G., Patterson, C. J., and Waller, R. I. (2001) Changes in sediment routing as a consequence of ice-sheet advance, Russell Glacier, Greenland. American Geophysical Union Fall Meeting, San Francisco, December 2001. EOS TRANS. AGU, 82 (47), Fall Meet. Suppl., Abstract.